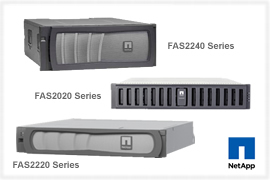 NetApp FAS2200 Series storage systems provides more powerful, affordable, and flexible storage solutions for midsized businesses and distributed enterprise environments. Available in three models NetApp FAS2220, FAS2240-2 & FAS2240-4. • The FAS2220 and FAS2240 provide more powerful systems that can fit any budge.